We do not know if Antonin Scalia was diagnosed with sleep apnea, though he had all the classic physical findings of the condition. For anyone experiencing OSA-like symptoms, it’s worth consulting with a doctor about it. Most patients are unfortunately undiagnosed. The sudden death of Supreme Court Justice Antonin Scalia was just one of 326,000 cases of out-of-hospital cardiac arrest occurring annually in the U.S., the vast majority among people with no known cardiac disease. Although no autopsy was carried out, it appears to be a sudden cardiac arrest rather than a typical heart attack, which means that it was not caused by blocked blood flow to the heart but rather by a cardiac malfunction that stopped the heart. When occurring at night, this is associated with a series of non-traditional risk factors, including possibly obstructive sleep apnea (OSA). To be clear: We do not know if Scalia had been diagnosed with OSA, if he was receiving treatment for it, or if he had brought a CPAP mask with him on his hunting trip. However, I am not the only doctor to have suggested OSA as a possibility. Moreover, there is little doubt that Justice Scalia had all the classic physical findings of the condition: He was an old and overweight man with a short, thick neck. In fact, for anyone experiencing OSA-like symptoms, it’s worth consulting with a doctor about it. Most patients are unfortunately undiagnosed. The condition is relatively new to medicine. It was first described in 1836 not by a physician but by a novelist: Charles Dickens. An astute observer, Dickens wrote in “The Pickwick Papers” of a “wonderfully fat boy” who snored a lot and dozed off throughout the day. The condition entered the medical lexicon only 70 years later, when the famed Canadian physician William Osler referred to the “fat boy in Pickwick” in his textbook of medicine. Still, it took 50 more years before the first medical description of “sleep apnea” was finally published — in 1956 — as a case of obesity, somnolence, and abnormal nocturnal respiration. Since then, the condition has dramatically increased in prevalence, probably as a result of the obesity epidemic. The American Academy of Sleep Medicine estimates that 25 million Americans may now have OSA. Of these, up to 90 percent are undiagnosed. If undiagnosed, and thus untreated, OSA may have devastating consequences: disruption in mood and daytime alertness, diabetes, hypertension, stroke, heart disease, and indeed, sudden cardiac death. The cause of sleep apnea is a neck deposition of fat that, during the relaxation associated with the deep phases of sleep, compresses the airways and literally chokes the patient — hence the “apnea.” The cessation of respiration lasts at least 10 seconds and results in a drop of oxygen that in turn partially reawakens the patient. The combination of apnea/reawakening may occur hundreds of times per night and, if the drop in oxygen is severe enough, may trigger cardiac arrhythmias. A Brazilian study found them in 92 percent of patients as opposed to 53 percent of people without. Nocturnal arrhythmias may result in sudden death. In fact, in contrast to the sudden death of the general population, that of OSA is much more likely to occur at night. The good news is that treatment with continuous positive airway pressure (CPAP) reduces the health risks of OSA, but this requires the condition to be recognized and treated. If indeed OSA was Scalia’s diagnosis, he’ll have joined some illustrious company. A cursory review of history suggests, for example, that what really tarnished Napoleon’s genius and eventually caused his demise were not the armies of Wellington, Blucher, and Kutuzov, but the fat buildup around the imperial neck, which reportedly caused Napoleon to fall asleep during important staff meetings and snore loudly. The French have recently written about it, and the evidence is quite suggestive. Other famous victims included Johannes Brahms, Winston Churchill, Grover Cleveland, and even Teddy Roosevelt. Teddy’s death was, in fact, quite similar to that of Justice Scalia in that it also occurred at night. It prompted national mourning. Indiana governor and future vice president Thomas Marshall even waxed lyrical that “Death had to take him in his sleep, for if he was awake there’d have been a fight.” Teddy was younger than Scalia (only 60), and even in his case there was no autopsy. Death was attributed to embolism, probably to his lungs but possibly to his brain. Yet, Teddy, too, seemed like a poster child for sleep apnea: chubby and with a short, thick neck. He was also a heavy snorer — a common problem in OSA. Roosevelt reportedly snored so loudly while in a hospital that almost every patient in the same wing voiced a complaint. 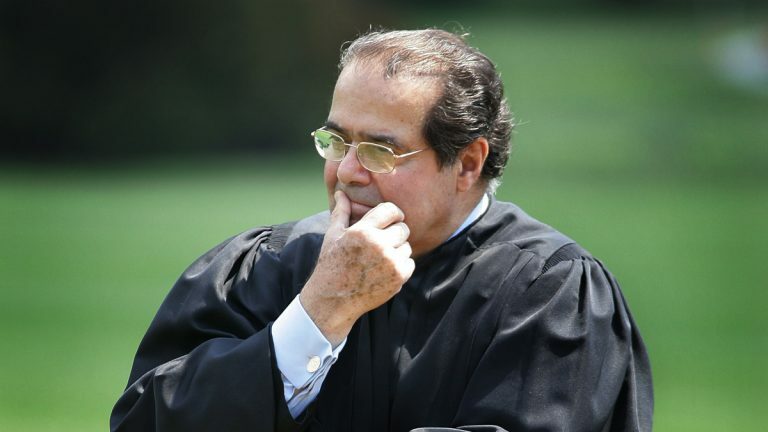 In the end, we may never know whether it was indeed sleep apnea that caused Scalia’s death. Yet, his passing may help increase awareness of the condition, and thus hopefully get more people diagnosed. Scalia would have appreciated it. Sal Mangione, MD, is a practicing pulmonologist at Sidney Kimmel Medical College of Thomas Jefferson University in Philadelphia, where he directs the physical diagnosis and history of medicine courses.